I have always wanted to do blog photos where Christmas trees are sold, and it's something that I never got to cross off my photoshoot location checklist while living in Charlotte. Maybe that worked out for the better... because getting to shoot amongst freshly snow covered Vermont Christmas trees for sale was really quite magical! The only thing not so magical was the weather... it was seriously 10 degrees when Amanda and I were out here! But we made it happen anyways, and I think it was worth it! I'm also getting real at the end of today's post about how to get real with yourself when the holiday season is filled with personal anxieties and stress. 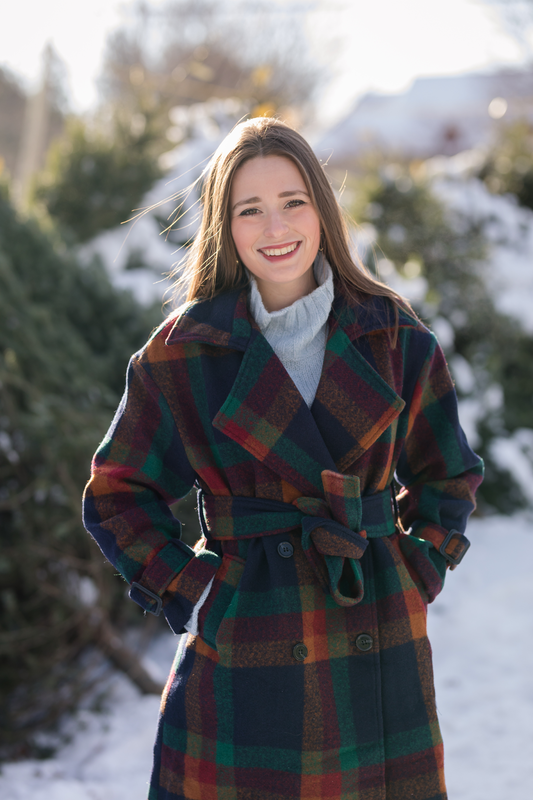 It is very hard to find a winter coat that is still cute and fashionable, but can also keep you warm and insulated in New England's bitter cold winter temperatures. I am so pleased to report that this gorgeous coat checks off both of those boxes! 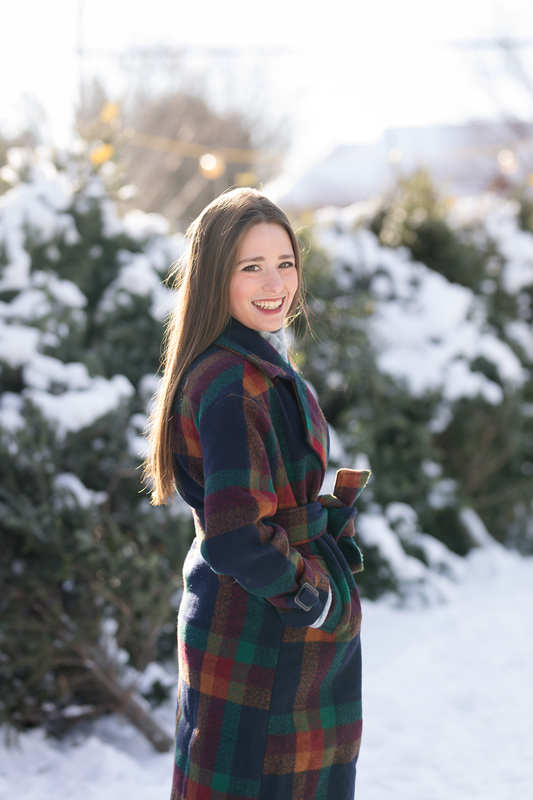 It actually kept me quite warm and toasty on the freezing morning that Amanda and I were out shooting these pictures, and I think it has the most darling plaid pattern as well! I know I'll be reaching for this coat many more times during the upcoming months of winter. A note on the sizing- this brand does tend to run smaller, so I ordered a M. It is a bit large, so I probably could have gone with a S (my normal size) and been fine. But sometimes it's good to have coats a little larger- that means you can wear a super thick sweater and scarf underneath and still have extra room! I am a fake Christmas tree girl all the way (check out this blog post to see how I decorated my tree this year! ), but I do think there is something very beautiful about Christmas tree farms or lots. Vermont is very big on all things local, so it wasn't surprising to me to learn that they have tons of tree farms here! Amanda and I stumbled on this little tree lot set up in downtown Shelburne, a quaint lakefront town near Burlington, and taking these photos there really did get me into the holiday spirit! This year could be my first white Christmas in several years! I have gone home to Maine every year for the holiday (minus a couple years where my parents and I have traveled), but the last few years it has been mild in New England for the holiday! One Christmas a few years ago it hit 60 degrees... not even joking (it was also my dream come true). Definitely a warm weather girl! Well- I might finally get to see a white Christmas again this year whether I like it or not! Snow is headed for Northern New England on Christmas Day! I'm just hoping the snow will coordinate itself around my driving schedule so I can make it home safely.... and be able to get home at all! Happy Thursday! Thanks so much as always for reading. Y'all's comments always truly make my day! I'm 50 years old. I follow you because my young nieces do, and I keep tabs as best as I can on their social media activities. 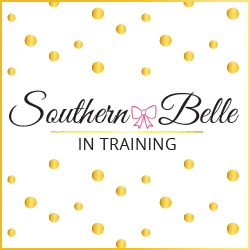 I want to complement you on your message about speaking up if you're going through something. Kudos to you for figuring out at such a (relatively speaking 😉) young age that mental health is as important as physical health. It's a wonderful message to share. I send you my best wishes for a Merry Christmas and safe travels. I live in upstate NY and I am SO excited for that snow heading our way! I am all for a white Christmas myself. Aww hope you're able to make it home safely -- drive careful! Good for you for being honest about dealing with anxiety and the blues this time of the year. While it's certainly no fun; I think it's so important to break the stigma about talking about mental health. Hoping you can relax and unwind with some downtime for Christmas. I've never had a white Chrostmas before, and this may be my first. I'm traveling to Michigan with my boyfriend to meet his family, and I don't think my little southern self is going to survive the cold. I don't lol bein cold at all. I could definitely use a coat like this for my trip. Such a cute coat! And I finally made the switch from a real to fake tree this year haha - we love it! This coat is absolutely beautiful! Like you said, I'm always struggling to find a coat that's both warm AND fashionable. NEED this one! I can relate to wanting to have a White Christmas. I live in the South and I have never seen snow as beautiful as in your pictures. Such a beautiful location! I loved all the snow on Christmas! These are all so beautiful! Snow is THE BEST! Especially in pictures. Hope you had a very Merry Christmas! That coat looks so beautiful and warm! Perfect for the winter weather!! That coat is SO cute!! We had a White Christmas and it was the best thing ever - everything is 10x more beautiful! You look amazing and that coat is so cute! Perfect Christmas coat! I just love love love that coat! It looks so cute and actually warm!